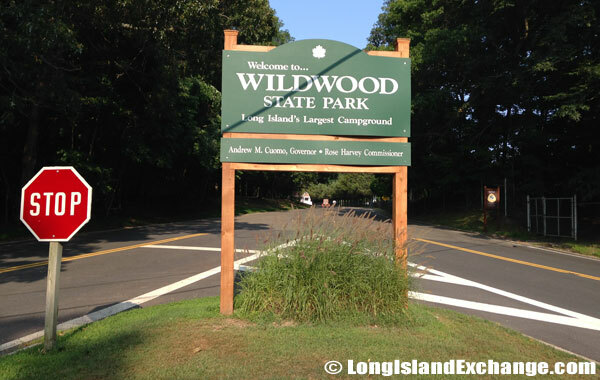 Directions: Wildwood State Park is located in Wading River, New York within Suffolk County, Long Island, New York. It is 73 miles from Manhattan. Long Island Expressway to exit 68. North on Route 46, and to Route 25A east. Left onto Sound Avenue – left at traffic light onto Hulse Landing Road. Park entrance is on the right. Entrance Fee: $10 per car from May 27 – September 2. For camping fees please click here. This 769-acre park sits above a rugged stretch of shoreline on the Sound. 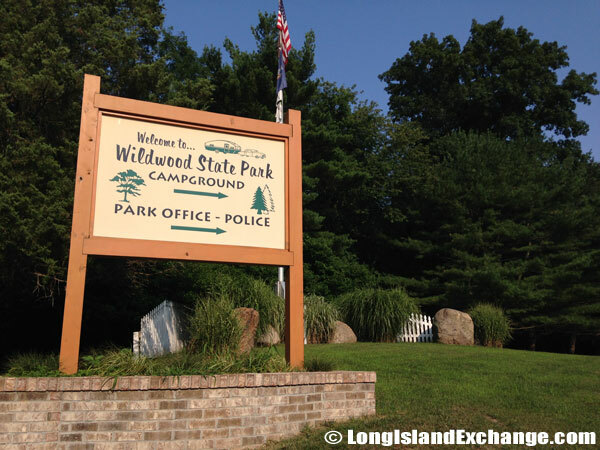 Wildwood is the only state park on the Island offering full hook-ups for trailer campers; campsites open through Columbus Day. 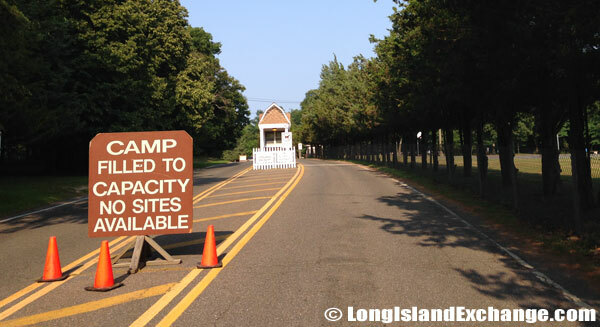 A sign welcomes visitors and campers to Wildwood State Park, Long Island’s largest campground. A fee booth collects the $10 car fee for entering the park until 4PM on weekdays and 6PM on weekends. 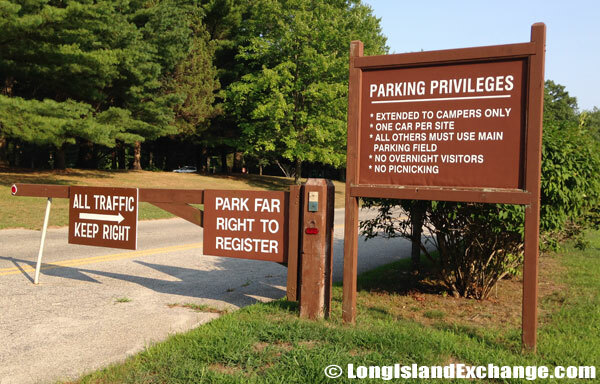 A sign welcomes visitors to the camping area on the south-side of Wildwood State Park. The park police station is also located in this area. 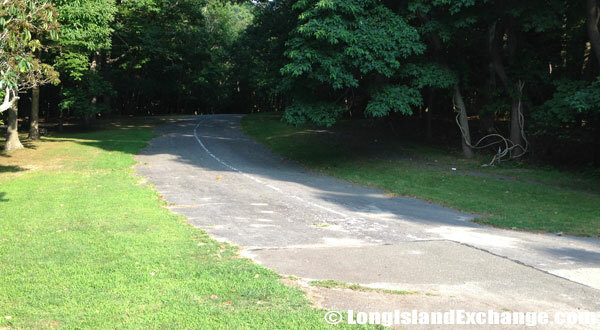 Overview: Wildwood State Park comprises 600 acres of undeveloped hardwood forest terminating on the high bluff overlooking Long Island Sound. Though the dense tree cover of the woods of the Park hold enormous treasures for the academically inclined and for researchers who wish to study the complex inter-relationships between the vast array of plant and animal life, the Wildwood State Park also suits most eminently those who just wish to spend a day in the midst of undiluted nature. It has vast stretches of wilderness, where markings for safety are the only signs of civilization. The Wildwood State Park helps people who live in cities and suburbs to know what life must have been like in pre-historic times. Swimmers can take advantage of the cool waters of the Sound, and picnickers can relax at shaded picnic tables as their children enjoy the nearby playground. Trailer and tent sites are also available for campers. 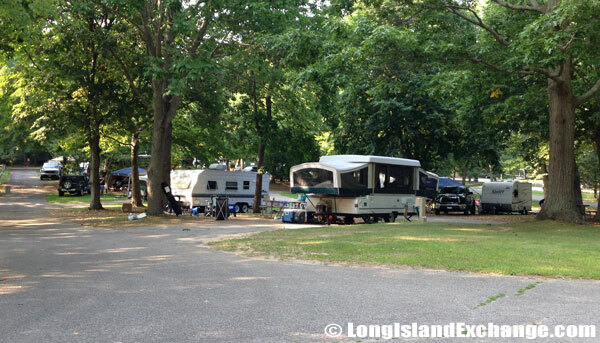 It has some of the best camping grounds in the entire Long Island, and to live here for a week and more in a trailer, or even better, in a tent, creates memories to savor for a lifetime. Fishing and hiking is the most productive from the observation and learning points of view, but those looking for exhilaration prefer to ski here in season or bicycle with energy throughout the year. Vacationers must enjoy the events and recreational activities provided by the Park. 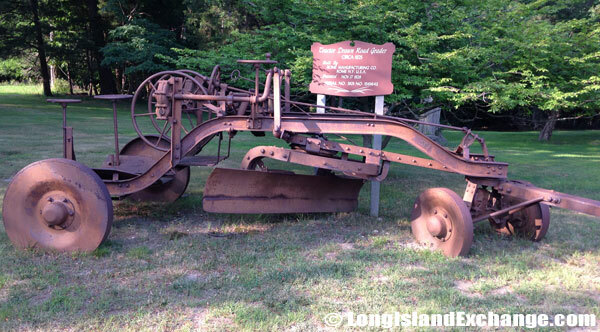 A tracker drawn road grader, circa 1925, built by Rome Manufacturing Company, Rome New York, Patented in 1929. Field 1 leads to the beach areas. 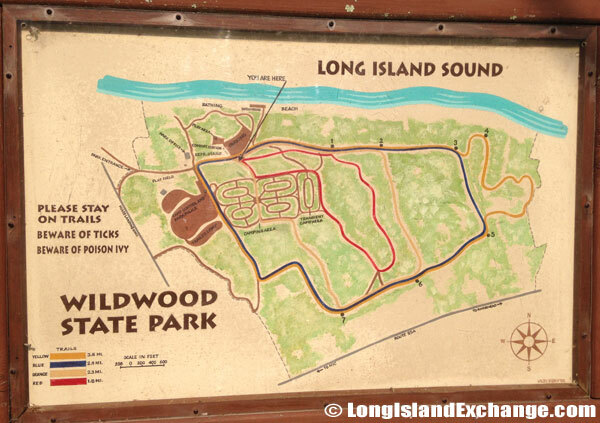 A sign lays out the map for Wildwood State Park. A festival each fall promotes the charms of the Wildwood State Park, and helps to raise awareness of this Long Island attraction. The Wildwood Fall Festival has loads of entertainment and games, and is especially directed towards the needs of children. 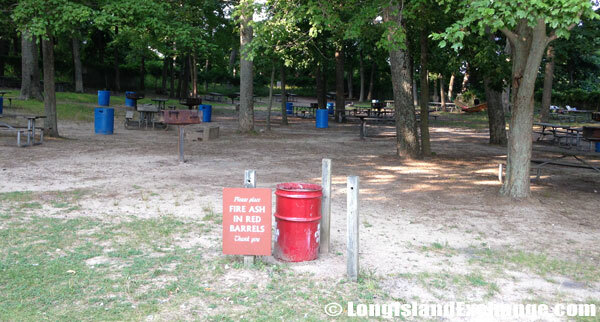 There are quite a few other natural reserves around and near the Wildwood State Park, so its camping grounds can be used as a base by vacationers from other States, to tour many places of ecological importance in Long Island. A road leads into the 12 miles of marked hiking trails which run behind the camp area. One of about two sectioned off picnic and barbeque areas. History: The Indian tribes were the first people descended here from the Arctic Tundra. They lived for centuries in sustainable manner, with light and transient footprints, but the agriculture, industry, commerce, resorts and townships of European civilization, for their innumerable benefits and advantages, have changed much of Long Island and its moraine habitat forever. Today, the Park has lots to offer including a beach, a playground, picnic tables, hiking and biking, fishing, a campground with tent and trailer sites, cross-country skiing, recreation programs, and a food concession. 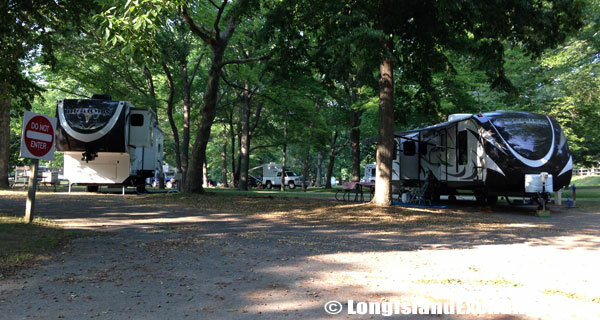 An area designated for camper parking allows only one passenger vehicle per spot. 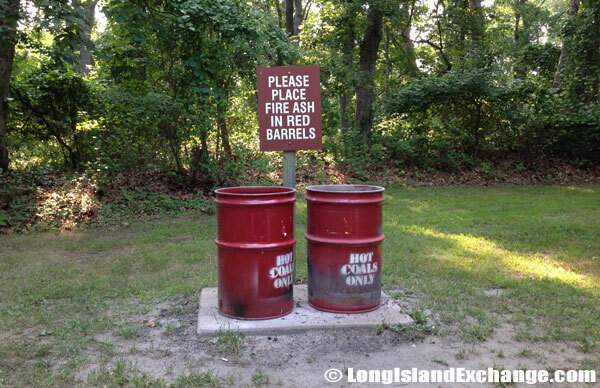 Several spots for pairs of fire and coal ash bins are seen throughout the camp grounds. 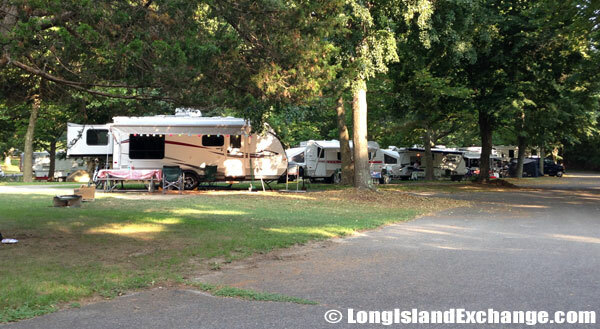 Parked campers cater to their owners at Wildwood State Park. 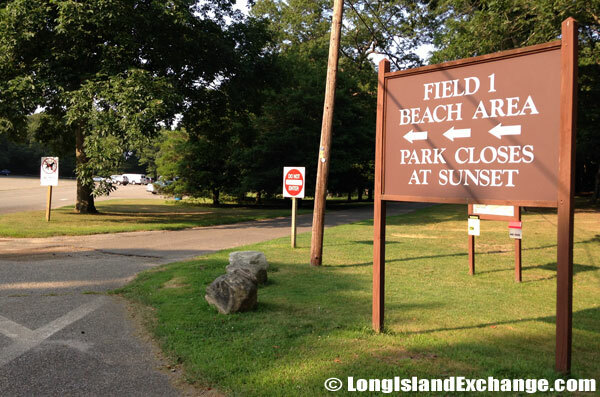 Facilities: 2 miles of beach on the Long Island Sound for fishing and swimming. 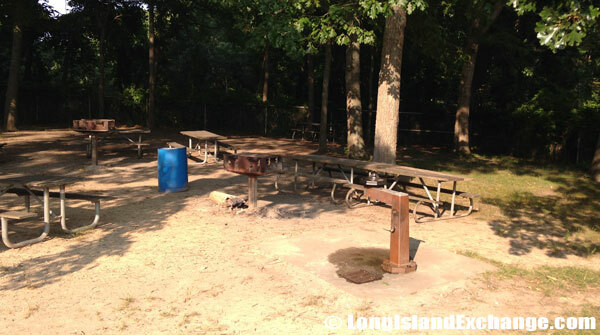 Each campsite has a picnic table, and dumping stations are nearby. The campground recycles newspaper and cardboard. Other amenities include food concessions, a nature trail, and 12 miles of marked hiking trails, a picnic area, basketball courts, ball fields, a playground, and showers. Firewood is for sale at the park; bring your own barbeque or metal fire container. Climate: A common amount of rain falls here at Wildwood State Park; the wettest month of the year is mostly May, that’s the one that rains the most; February is when it’s the driest. Seasons/Hours: Open year round. Camping season begins the first weekend of April and ends on Columbus Day weekend. Events: Wildwood Fall Festival, and Cross-Country Ski Clinic (dates not set).